curtain going up on the night time shadow play. and bones in the mud — was the blood sacrifice required? reality distorted like a sat-on hat. the mayor and his uniformed monkeys have been well paid. into the title montage of a new episode. and the shape of home is under your fingernails..
can you tally what it’s worth? This song is included in the book Refugium Poems for the Pacific which was compiled by Yvonne Bloomer. “Twelve Gates To The City” which is traditional with additional verses written by Bruce Cockburn and published by Holy Drone Corp. Thanks are due, whether they like it or not, to: Jeff Garner, the Gospel of Mark (Forty Years in the Wilderness); Charlie, Craig, Pam and Pam, Amanda, Philip, Belinda, Fiona, Carl, Sheila and the rest of the morning gang at Peet’s (Cafe Society); Brian Johnson, Julie Wolf, Al Purdy RIP (3 Al Purdys); les Guillaumes…Appollinaire et Chattier (Mon Chemin); Yvonne Blomer, Enbridge et al (False River); SF Lighthouse, Marc Bregman (Jesus Train); Brownie McGee and Sonny Terry, Rev Gary Davis (Twelve Gates to the City); God, MJ, Iona, Bernie Finkelstein, Daniel Keebler, and the United States of America, for welcoming me into its tender embrace. 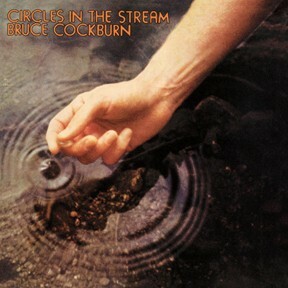 Few recording artists are as creative and prolific as Bruce Cockburn. Since his self-titled debut in 1970, the Canadian singer-songwriter has issued a steady stream of acclaimed albums every couple of years. But that output suddenly ran dry in 2011 following the release of Small Source of Comfort. There were good reasons for the drought. For one thing, Cockburn became a father again with the birth of his daughter Iona. Then there was the publication of his 2014 memoir Rumours of Glory. Such doubt was new to the man who’s rarely been at a loss for words as he’s distilled political views, spiritual revelations and personal experiences into some of popular music’s most compelling songs. What spurred Cockburn back into songwriting was an invitation to contribute a song to a documentary film about the late, seminal Canadian poet Al Purdy and he was off to the races. Cockburn’s rugged fingerpicking style on the Dobro perfectly matches Purdy’s plainspoken words and the grizzled voice of his street character. A similar guitar style can be heard on two of the next songs Cockburn wrote, the gospel-like “Jesus Train,” and “Café Society,” a bluesy number about people who gather at his local coffee shop to sip their java and talk about the state of the world. There’s a prevalent urgency and anxious tone to much of the album, which Cockburn attributes to living in America during the Trump era. 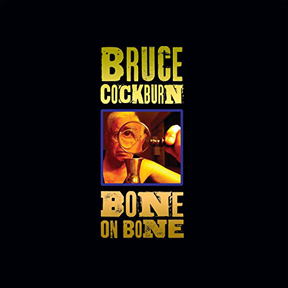 But, more than anything, Bone on Bone amounts to the deepest expression of Cockburn’s spiritual concerns to date. The 12-time Juno winner and Canadian Music Hall of Fame inductee turned away from traditional Christianity in the mid-1970s toward a quest for the more all-inclusive mysticism he documents in his memoir. 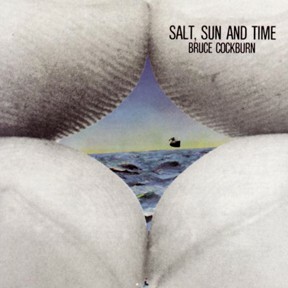 And it’s that kind of spirituality that figures prominently in “Jesus Train” and “Twelve Gates to the City.” In “Looking and Waiting,” Cockburn sings of “scanning the skies for a beacon” from the divine. “Forty Years in the Wilderness” is one of several songs that feature a number of singers from the church Cockburn frequents, for the sake of convenience referred to in the album credits as the San Francisco Lighthouse “Chorus.” “The music was one of the enticements that drew me to SF Lighthouse. As I found myself becoming one of the regulars there, and got to know the people, I felt that I really wanted all these great singers, who were now becoming friends, to be on the album. They were kind enough to say yes!” Among other songs, they contribute call-and-response vocals to the stirring “Stab at Matter.” Other guests on the album include singer-songwriters Ruby Amanfu, Mary Gauthier, and Brandon Robert Young, along with bassist Roberto Occhipinti, and Julie Wolf, who plays accordion on “3 Al Purdys” and sings with the folks from Lighthouse, together with LA songwriter Tamara Silvera. 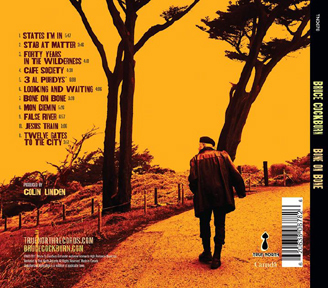 Produced by Colin Linden, Cockburn’s longtime collaborator, the album is built around the musicianship of Cockburn on guitar and the core accompaniment of bassist John Dymond and drummer Gary Craig. Also very much part of the sound is the accordion playing of Cockburn’s nephew John Aaron Cockburn and the solos of noted fluegelhorn player Ron Miles (check out his stunning work on the cascading “Mon Chemin,” for example). Look out the window, what do I see? Cows hangin’ out under spreading trees. Where such a place is? It’s my turn but where’s the guide? For any one of my thousand faces? * Bonus tracks on the remastered CD version released by Rounder Records in 2003. So honey come and help me build this totem pole. 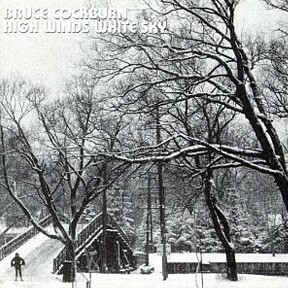 “Images and references to rivers, birds, mountains, and especially, sunlight abound on 1971’s High Winds White Sky as they do on Cockburn’s previous self-titled debut album and the subsequent Sunwheel Dance. The three albums formed a powerful acoustic trilology that established Cockburn as one of Canada’s most important performers of introspective, literate songs. Dreaming is a state of death, can’t you see? Update: 2003 – This song was rewritten and rerecorded for a compilation album put out by warchild.ca. To hit the ground and mean it. And he cries, “Why don’t we celebrate? Love can make you sad. To kiss the sun and mean it. And he screams, “Why don’t we celebrate? Life can make you sad. So why don’t we celebrate? The album was recorded and mixed between mid-September and mid-December, 1971 at Thunder Sound in Toronto. The engineer was Bill Seddon. The cover design and photography was done by Bart Schoales. Produced by Eugene Martynec for True North Productions. Includes the classic ‘Mamma Wants To Barrelhouse All Night Long’. 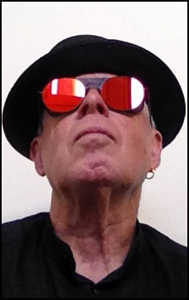 All songs written by B. Cockburn © 1973 Golden Mountain Music Corp. (SOCAN) (BMI) All Rights Reserved. Used by Permission. Stronger for the Saviour’s name. Produced by Bruce Anthony and Eugene Martynec for True North Productions. All songs mixed at Thunder Sound with Bill Seddon as Engineer except songs 2 [Salt, Sun and Time] and 5 [Roulier Sa Bosse] which were mixed at Manta Sound with Leo De Carlo. how come nobody ever seems to learn? See how the starwheel turns. If they didn’t have the CIA? Into blue shadows by a white-baked wall. Sing me that love song again. 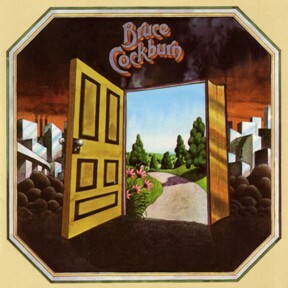 All songs written by B. Cockburn except + [Starwheel] by B. Cockburn-K. Cockburn © 1975 Golden Mountain Music Corp. (SOCAN) (BMI) All Rights Reserved. Used by Permission. * Deluxe Edition – Bonus tracks on the remastered CD version released by Rounder Records in 2002. And a voice from somewhere scolds a barking dog. and wonder at the lamp-warm window’s welcome smile. Saying, “If you can’t eat the fish, fish in some other lake. And a helpless rage seems to set my brain on fire. It’s a sign of a hope that’s ours for all time. We’ll meet again at the festival of friends. An invitation to the festival of friends. That’s your ticket to the festival of friends. To lead us to his festival of friends. 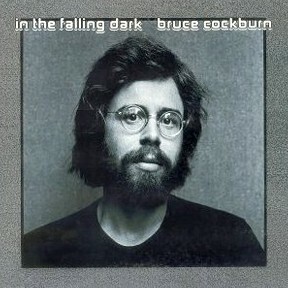 Originally released in 1976, In The Falling Dark was the first of a trilogy of recordings, that bridged Bruce Cockburn’s acoustic work of the early 70s with his electic period a decade later. It’s landmark album, one that anounced Cockburn’s arrival as an important songwriter. But it’s also a generative recording planting the creative seeds that came to fruition fully on the subsequent studio albums “Further Adventures Of” and “Dancing In The Dragon’s Jaw”. With its compelling songs and majestic sweep “In The Falling Dark” is a perfect place to discover the impressive range of Bruce Cockburn’s artistry. Apologies to Tommy Graham who played tambora on “Joy Will Find a Way” and got no credit for it-and to Mose and Heather Scarlett who sang on the same album. Thanks to “Encounter 76”-the messages were deeply appreciated and the money put to good use. All Rights Reserved Used by Permission. Digitally Remastered by Vic Anesini, Sony Studios,NY. Digitally remastered at the E Room in Toronto by engineer Peter Moore, utilizing 24-bit technology. New liner note essay written by Nicholas Jennings. Released by Rounder Records, 19 November 2002. * Bonus tracks on the remastered CD version released by Rounder Records in 2005. Note: The album notes say this song – a solo bagpipe piece – is performed by Pipe Major Ray MacKay. The first part of the tune I don’t recognise but is probably a traditional Scottish pipe tune, the second part is “Scotland The Brave”. On the album, the song serves as an introduction to Starwheel. House sound and stage monitoring by Westbury. * Bonus tracks on the remastered CD version released by Rounder Records in 2002. Left me laughing like a well-loved child. So take a look and tell me, can you hear those black holes call? And cut by the love that flows like a fountain from God. It’s time for chaos to win and walk off with the prize which turns out to be (a big fat) nothing. It’s time for us all to stand hushed in the cathedral of silence waiting at the river’s end. 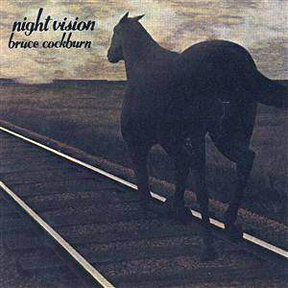 Released in 1978 this was Cockburn’s ninth album and contains the timeless tracks ‘Montreal Song’ and ‘Laughter’. Thanks for aid and/or inspiration to: Jesus, Kitty, Harvey Cox The Secular City “Feast of Fools’), Farrago Folks, Michael Moorcock (The Cornelius Chronicles), Tony Silverthorn, Tom’s Cabin people, and all involved in the making of the album. All songs copyright © Golden Mountain Corp. Released by Rounder Records, 2002. 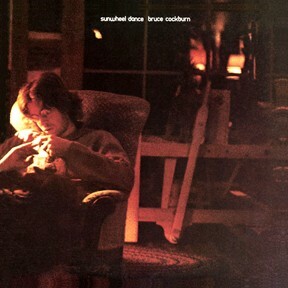 November 19, 2002 – From Rounder Records: “Further Adventures Of” contains some of the most beautifully intricate acoustic guitar work and lyrical mysticism Bruce Cockburn has ever put on record. 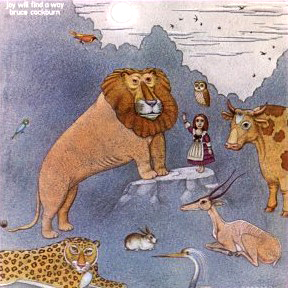 Originally released in 1978 and now re-mastered for this deluxe reissue, “Further Adventures Of” features standouts such as “Outside a Broken Phone Booth with Money in My Hands,” “Red Ships Take Off in the Distance,” and “Feast of Fools.” An instrumental bonus track originally recorded for the record, “Mountain Call,” is also included. 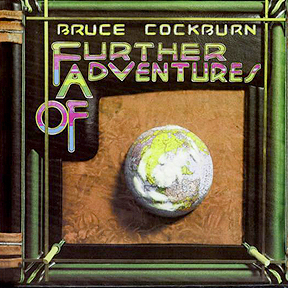 “Further Adventures Of” continues the spirited acoustic jazz of Cockburn’s previous recording and finds him in full, exploratory flight. Produced by Eugene Martynec.